My AirBnB experience: 9 different places in 9 weeks. For the most part, my AirBnB experiences have been really positive. So far each one has had at least one thing wrong with it, but often getting to meet someone new or seeing a different part of the city or having other really nice amenities easily makes up for it. Better experience and/or cheaper than many hotels, and, as with hotels, if you spend more you get a nicer experience. Still, this post is a listing of those nigglings. Once I got to LA in September, I decided that I wanted to live in a bunch of different places to check out different neighborhoods before committing to a place more permanently. My appointment at Pepperdine is for this school year, which is about 8 months, so the plan was to check out different places for 2 months and then sign a 6-month lease. At the time, this plan also made sense because I knew I was going to be gone for 3 weeks at a couple of different conferences in October, so why pay rent for those 3 weeks? 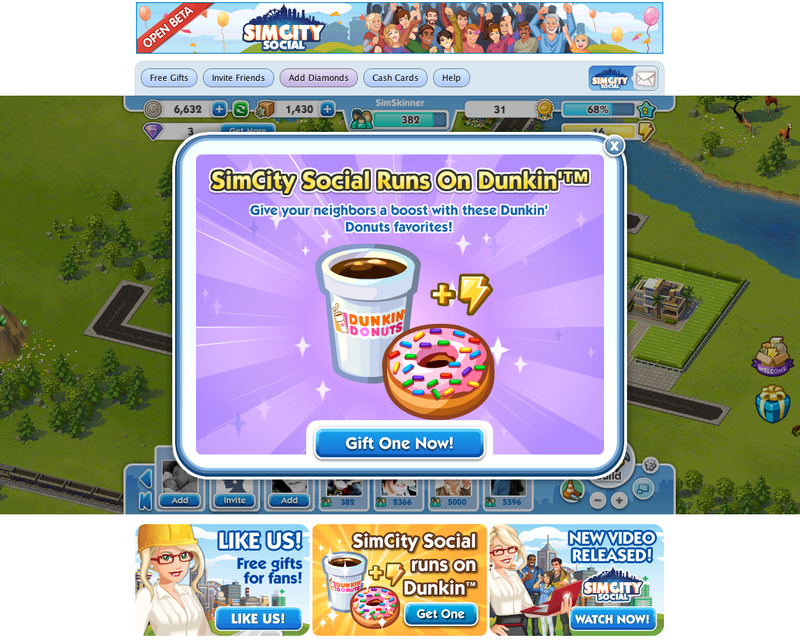 Been getting SimCity Social invites in my inbox this week. Tried it this morning. I like how the advisor that helps you is a spinning wheel. So post human. Also, apparently, it runs on Dunkin Donuts. Phone Killer. Player continually accrues points while their phone’s screen is off. The points continually increase exponentially, encouraging people to keep their phone screens off for as long as possible. Long idle times = bigger payoffs. Additionally, a large lump sum payoff is given when turning the screen off after the phone is active, though, if someone chain-turned on and off the phone, they’d get points at about the same rate as if they just left the phone idle while the screen was off. The idea is subversive in that it rewards players for not using their phone. Oh, while the phone is charging, player receives no points. If the battery is lower than 25% player receives double points. Now that I think about it, I’m not sure these games are even possible on the iPhone. How is it with background apps or apps running while the phone isn’t actually active? So, I played Dragon Age for a couple of weeks. It’s engrossing. Very engrossing. But I *was* disappointed with how little change there is to the plot or storyline with each of the six different starting conditions. Each start story was really well done, so to have the narratives from a particular one be mostly forgotten once you get to the main game… Well, on the official forums, SLPr0 wrote up a nice overview of some of the ways in which the plot could have been so much more (included after the break). Head on over to the forum thread (Literary Criticism in Regards to Flopped Plot Opportunities and the Human Noble Origin) to read the ongoing discussion. And, of course, there’s Yahtzee’s take on Dragon Age, which is, as with all his Zero Punctuation videos, hilarious and spot on in that scathing-yet-there’s-a-bit-of-truth-there kind of way. We can finally play Telephone Pictionary online at BrokenPictureTelephone! Thanks Aaron for forwarding this!